Philadelphia 76ers center Joel Embiid reacts in front of guard Marco Belinelli and forward Dario Saric after his dunk against the Boston Celtics during the second quarter in game three of the second round of the 2018 NBA Playoffs at Wells Fargo Center. All-NBA is one of the most prestigious honors a player can earn during his career, and it has only taken a second season for Joel Embiid to climb his way near the top of the totem pole. Embiid was named to the All-NBA second team on Thursday afternoon, earning a tremendous honor early in his career. Up until the final stanza of the season, Embiid had as good a shot as anybody at making it onto the first team. But a number of factors went against him down the stretch. Embiid's absence during the final stretch of the season left him with only 63 games played, which is more than enough to get consideration for these awards but not enough to override other stars with more time put in. And beyond the overly simplistic games played argument, Davis was frighteningly good in the season's second-half, putting New Orleans on his back after DeMarcus Cousins went down for an injury. He may have had a worse defensive season than Embiid, but I think he certainly had the better season. Did Joel Embiid get snubbed for First-Team All Defense? There are few complaints you could make about the field overall, with the first team consisting of the five lead candidates for MVP this season. As the only member of the second team making his first appearance on an All-NBA team, Embiid is doing plenty well for himself at age 24. The young center from Cameroon won't be happy about being bumped down, but the Sixers will frankly be overjoyed for the way things turned out. Because he has already been ruled out of the MVP finalists, Embiid will not hit one of the qualifiers to be eligible for a 30 percent max contract. 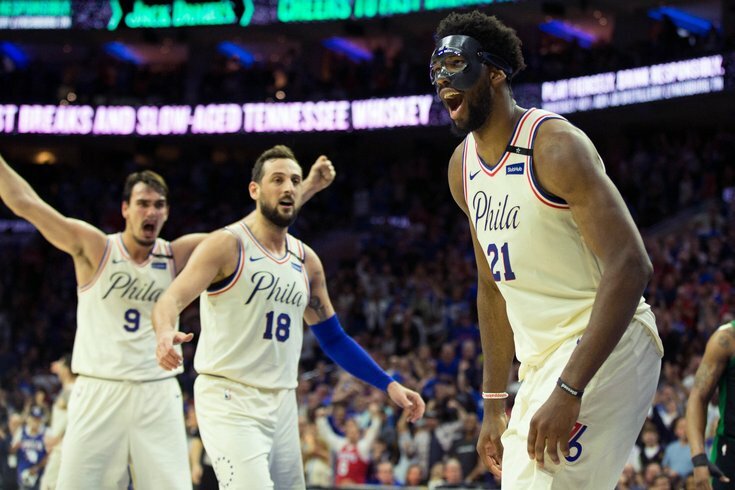 While in negotiations for his contract last summer, the Sixers specifically moved to have the thresholds set for these two lofty goals, league sources relayed to PhillyVoice, which otherwise would normally include an All-NBA selection of any kind. In practical terms, that means the Sixers will have five million dollars more in cap space than they would have if he had been named to First Team All-NBA this season. A small portion of their path forward, but found money nonetheless. I will stop short of saying they should celebrate this occasion because it seems weird to applaud the fact that an elite basketball player now has lower earning potential moving forward. And before we move on to other items, a moment of appreciation needs to go out to Embiid for what it took to get here. He was written off by observers from several corners of the basketball universe and dealt with deep, dark tragedy in his personal life on top of rehabilitating from foot surgery for two consecutive years. The mental hurdles he had to overcome were tough enough on their own, to say nothing of the rehab and physical therapy it took to get there. Perhaps one day we can look at that as a mere footnote in a great career. From where we sit now, however, it should be celebrated as a testament to his character that he rebounded from everything he faced to become one of the league's elite players. Of further note from the results in Sixers world as well: Ben Simmons finished with 36 total votes on the ballot, the fourth-highest total of any player left off the All-NBA teams behind Chris Paul, Rudy Gobert, and Kyrie Irving. His primary competitor for Rookie of the Year, Donovan Mitchell, received just two votes in comparison. That should give you a small indication of how the award race in that category will shake out. For all the hemming and hawing about whether "The Process" was worth it, the results here seem to indicate a resounding yes. They have one player who has been named among the 15 best and most productive players in the league, with a rookie finishin just outside of the field with the 19th highest total among voters. The Sixers have more talent between those two guys on the roster than they've had in pretty much any season over the last few decades, and with tons of growth potential between the duo. That's something for Sixers fans to get fired up about, even if the franchise can't be content to rest on its laurels. This could be the start of something big if management can find the right supporting cast, and above all else is a deserved honor for a spectacular player. Raise your Shirley Temples for the big man one time.